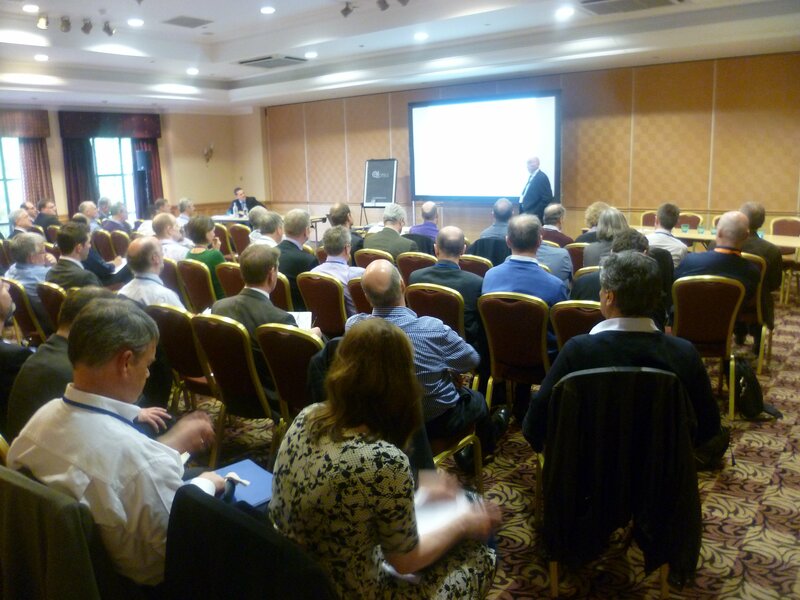 This meeting was attended by 90 delegates, currently the record attendance. 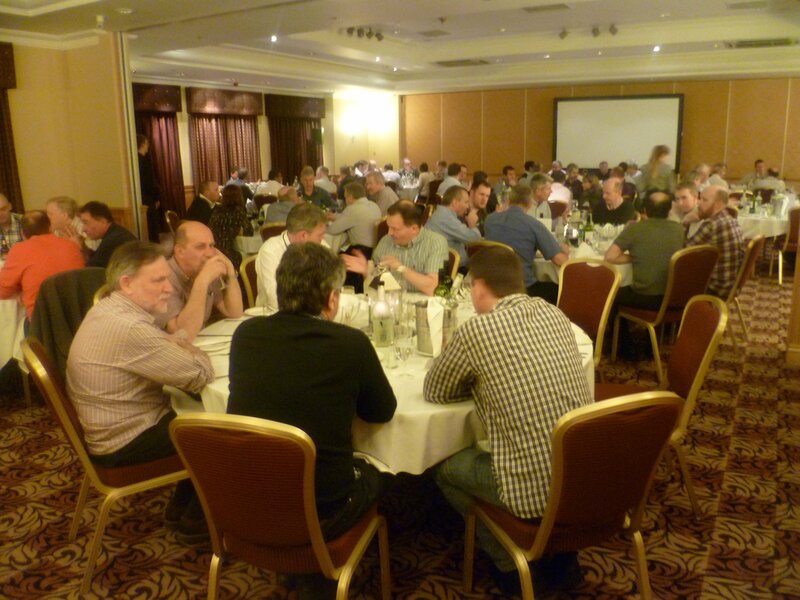 The increasing popularity of the bi-annual RF & Microwave Society meetings was clearly demonstrated by the gathering of engineers, academics and business people from across the industry. Although the continued interest in amplifier efficiency was demonstrated by the number of papers that focused on this topic, including the winner of the best paper award, “Understanding the 3 level Doherty” by Mike Roberts of Slipstream Design, the subjects covered ranged from an FMCW MIMO Radar Sensor to a “Prescription for THz Transistor Characterisation”, by Dylan Williams of NIST. A panel session was introduced for this conference, “RF Semiconductor Technology Road Map – are we changing lanes, or adding them to increase capacity”. Participants from Analog Devices, MACOM, NXP, Peregrine and UMS gave their perspectives on the movements and directions of technology in the future, which was followed by a lively audience discussion; continuing during the traditional, ever popular Society Dinner. The setting for the panel discussion was well prepared by a presentation by Terry Edwards, “MMIC Futures”, looking at the current size and state of the market, the key players and asking some probing questions about what developments we can expect to see over the next 5 and even 10 years. A regular participant at ARMMS, Liam Devlin of Plextek-RFI gave a clear and concise presentation “The Future of MM-Wave Packaging”, adding knowledge to an area often taken for granted but having critical implications for performance. Of particular note were the 3-D structures used for antenna within package and the creation of coaxial lines from bond wires. University participation was again high with two papers each from Cardiff and Imperial; ARMMS provides sponsorships for up to 2 students per conference who are presenting papers. This covers all conferences fees and a contribution towards travel costs. At the meeting the Society was told how a previous student presenter has now been taken on by Surrey Satellite Technology on their undergraduate sponsorship scheme. 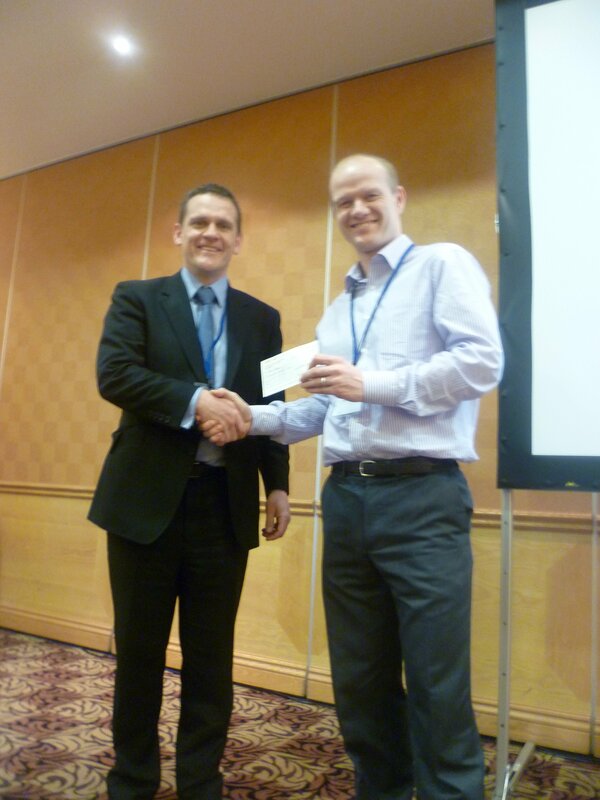 The roots of ARMMS lie in test and measurement; the connections remain strong, including a paper on measurement automation using Python, to the characterisation and optimisation of Envelope Tracking Systems, given by Peter Cain of Agilent Technologies, which was a close 2nd in the best paper award. The parallel exhibition provided the usual opportunities to meet colleagues across the industry, with many fruitful conversations between suppliers and customers. For those interested in copies of the papers they will be available from April 2015 on the ARMMS website, where details of the next conference can also be found. The society is grateful to Tim Masson of Agilent Technologies, Technical Coordinator for the meeting and Slipstream Design for their sponsorship. It is possible to linearise RF power amplifiers by signal injection, at the output port, using a time varying baseband voltage waveform. The key is the formulation and optimisation of this time varying baseband voltage. This paper will demonstrate that an envelope domain formulation is ideal. In this formulation, ‘engineering’ the optimised time varying baseband voltage requires the determination of only a small number of constant coefficients. These coefficients should be invariant to changes in the complexity and bandwidth of the RF modulation signal applied. A large signal waveform measurement system (LSWMS), modified to enable the measurement of modulated RF signals and provide for the ‘engineering’ of injected baseband voltage waveforms has been used to experimentally investigate and validate this approach. The investigation and validation experiment was performed on a 10W Cree GaN HEMT device, using a 3-tone modulated RF excitation signal with RF fundamental and all harmonic frequencies terminated into a passive 50ohms. IM3 and IM5 distortions were successfully suppressed by this approach for an optimum case by the determination of these coefficients, only two coefficients in this case. For the optimum case, the observed level of IM3 and IM5 distortion were reduced to less than -56dBc whilst driving into 1.5 dB of compression. The advantage of this technique is that it is simple and its implementation is compatible with envelope tracking architectures. Advances in microwave wafer probes and vector network analyzers now make possible accurate on-wafer measurements in printed transmission lines at microwave, millimeter-wave, sub-millimeter-wave, and even terahertz frequencies. Dr. Dylan Williams, winner of the 2013 IEEE Joseph F. Keithley Award in Instrumentation and Measurement, will introduce you to the progress made on this subject at the National Institute of Standards and Technology. He will discuss the fundamental principles behind accurate on-wafer measurements, and show how adhering to these principles has led to the development of “A Prescription for THz Transistor Characterization.” The lessons learned are useful at any frequency. There are a number of potential applications for low cost short range phased array radar sensors: ship bumpers, large vehicle sensors and level crossing obstacle detection for example. Phased arrays have the benefit of reduced size and the elimination of moving parts compared with more traditional rotating antenna systems. Another potential benefit is that the image update rate can be orders of magnitude faster than that for mechanically steered radars. Phased array radars have been developed for many years but the high cost has traditionally limited their use to high performance military radars. Co-located Multiple-In Multiple-Out (MIMO) systems have the potential to mimic the performance of more expensive traditional systems but with substantially lower cost. Such an example system is presented here using 4 transmit elements and 16 receivers to synthesize a 64 virtual element phased array. An integrated 24GHz sensor has been made and field trials performed which confirm the range and angle resolution performance. Envelope tracking (ET) amplifiers are implemented by modulating the DC supply to the drain of a transistor with the objective of improving the device efficiency under power back-off conditions. However, changing the drain voltage also changes the drain-to-source capacitance (Cds) of the device, causing the optimum output impedance to shift. This paper investigates the behavior of the current and voltage waveforms at the current generator plane of a High Voltage LDMOS device in an emulated ET architecture, and the trajectory of the optimum load impedance on the package plane as the drain voltage supply is varied throughout the ET operating range. An example of a class-F mode operating in an ET setting is shown as an example to understand the degradation of the overall drain efficiency, which was analysed using the waveform engineering approach. Screen printing and laser machining are standard processes for the development of RF circuits on many substrates including ceramics (e.g. LTCC), having low losses from 2 to 10 GHz and low material and processing costs. However, the integration of functional components provides a challenge as semiconductor-based devices are generally very expensive. In this work we propose a novel idea, which allows the integration of RF MEMS switches on LTCC using low cost materials and assembly techniques. Shunt switches and varactors can be realized using aluminium foil cantilevers, which can be controlled by applying suitable electrostatic actuation. Basic prototype components have been produced and preliminary tests suggest good mechanical behaviour. It is believed that the enabling technologies developed can be applied to create ultralow-cost RF MEMS switches and varactors. The desire for higher data throughput in satellite links has led to the adoption of more complex modulation schemes and more effective forward-error correction algorithms, to operate ever closer to Shannon’s limit for capacity at a given SNR. This combined with the flexibility of frequency plans in modern satellite payloads, provides the satellite service operator with many variables to control, for example: the number of carriers, bandwidths, filtering, modulation and coding; chosen to suit not only current weather conditions, but also the data rate demand and desired Coded Packet Error Rate (for a minimum quality of service). Unfortunately modeling the end-to-end satellite link with spreadsheet formulae alone has become a limiting factor. A Model-Driven Engineering (MDE) approach is proposed to analyse the end-to-end satellite link, and to answer vital questions such as the quantifiable impact analog distortions (such as intermodulation distortion, filter ripple, mismatch, group delay) will have on the Error Vector Magnitude (EVM) and consequently Coded Error Rate (CER) of a complex modulated signal. Agilent will present an example payload repeater design in SystemVue 2013.08 for analyzing the end-to-end system performance of a link, paying careful attention to modeling specific impairments and distortions throughout the payload repeater. This paper shows simulated and measured results of ultra-low cost filters in the mm-wave and THz bands. It provides a broad overview of the filters currently available and their suitability for ultra-low cost applications. We demonstrate scalable conventional metal mesh filters on standard 525 um quartz and high resistivity silicon substrates. In additional, trapped mode excitation is used to improve out-of-band rejection at higher frequencies. The measured results shows that these filters are scalable in the THz range using cost-effective micromachining manufacturing. This potentially opens up the possibility of using metal mesh filters for ultra-low cost applications. In this paper and the accompanying presentation, Python will be demonstrated as a rapid development programming environment for measurement automation using the GPIB interface common on many instruments. The free Python language, a low cost USB to GPIB interface and a basic driver written in Python allows live instrument control from a command shell. To illustrate the power and utility of this approach, a demonstration will fetch array data from a network analyser, then use standard libraries to manipulate and plot the results. Finally to show the extendibility of this idea, the paper presents a Python based graphical user interface (GUI) to an HP8753 network analyser for plot capture and storage. The concepts demonstrated are very cost effective, highly productive and ideally suited to small and medium sized enterprises. Today the great majority of RF/microwave systems implement various classes of MMICs. There is a vast range of implementations from high-volume smartphones through to AESA radars. Various products are commercially available operating across frequency bands ranging from hundreds of MHz to beyond 100 GHz. This paper focuses on the current state of the MMICs side of the industry, identifies influential trends and developments – and then takes a look at the future. Leading fabricators and fabless concerns are identified and commented upon. The shift from dominantly GaAs-based to increasingly GaN and SiGe-based is considered in some detail – including near-future implications. Estimated market shares are presented. This panel session will try to look forward to see where semiconductor developments are taking the industry. It will feature short presentations from the companies below, followed by an open questions and answers session. Terry Edwards of Engalgo will also join the panel, which will follow his presentation on the MMIC market. Envelope tracking requires the addition of another connector to the RF power amplifier. Providing this 'supply modulation' input leads to many possibilities for improving the performance of the device, such as substantial improvements in linearity and a reduction in the heat dissipated in the RF PA. If the modulating power supply if efficient, you can reduce energy consumption from the battery. However, it’s not a journey into a land of completely alloyed pleasures for the designer. Having recovered from the shock of being told all the decoupling capacitors worth being called such, are to be removed, the RF engineer comes back to his design to find while it doesn’t burn his fingers, nasty things can happen to the broadband noise floor. This paper takes a practical look at measuring what happens when you apply ET and DPD, using kit you already have, or can easily get. The mass market for consumer wireless products led to the development of low cost packaging technology suitable for use at RF frequencies. As the market developed there was a drive for miniaturisation that helped reduce package parasitics, which assisted in pushing up the maximum operating frequency. ICs are now readily available in Surface Mount Technology (SMT) packages with maximum operating frequencies of around 40 to 45GHz. Further development work is now on-going to push the upper operating frequency of SMT packaged MMICs still higher. Of particular interest is SMT packaging for use at V-band (to address the ISM bands around 60GHz), for automotive applications at 77GHz and 79GHz and for E-band applications at 71-76GHz and 81-86GHz. This presentation discusses the challenges of meeting these requirements and looks at the potential approaches that could be used to address them. It is based on an article that was published in the February 2014 issue of Microwave Journal. The Doherty amplifier is a well known technique for improving efficiency of a power amplifier in a backed off condition. The standard 2 way Doherty amplifier with a peak in efficiency at 6dB back off and full power is commonly used and well understood. With the use of increasingly complex signals comes the requirement to move the peak in efficiency to higher levels of back off whilst maintaining efficiency up to full power output. This can be achieved with asymmetrical Doherty amplifiers or by utilising N-Way Doherty techniques. In this paper we will explain from first principles the operation of the 3 Level Doherty architecture based on an NXP design that uses three LDMOS transistors of equal size. Design challenges faced with this type of amplifier are presented and compared against conventional 3-Way Doherty and asymmetrical architectures. Test results are presented which demonstrate a drain efficiency of greater than 40% at 10dB back off.